Kevin Maguire and Joe Rubenstein Formerly Known as the Justice League #1 Page 6 Original Art (DC, 2003). Several non-DC characters get in on the action in this amusing splash page where a bunch of smart guys take a test. 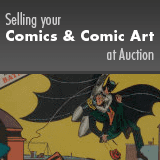 Image area measures 10.5" x 15.75" and the art is in Excellent condition. From the Shamus Modern Masterworks Collection.